In 2016, Backlinko conducted a study and found that… the average Google first page result contains 1,890 words. Earlier, back in 2012, a study done by SERPIQ found that the average number of words for #1 result was 2,416. And for result #10, the words count was 2,032. 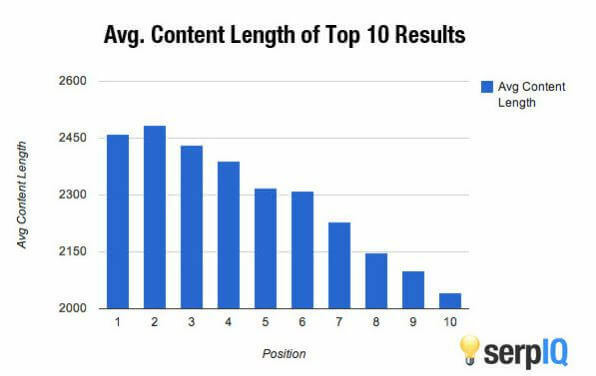 There have been many such studies done to find the correlation between the length of articles and Google ranking. And almost all of them concludes that publishing in-depth contents is a much better choice to rank high on search engine. Also, such detailed pieces get more backlinks, which, again, go on to influence ranking positively. Google loves long-form contents. Or at least that’s what these numbers and experts say. 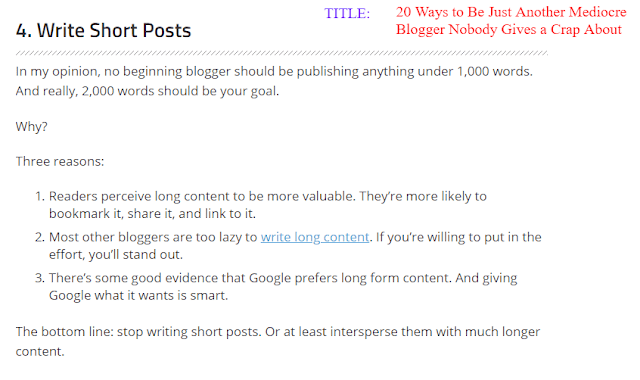 Many of today’s top bloggers shell out extravagantly long articles. And the new bloggers are fed to follow the same suit to produce long (and tedious) contents. And frankly, many of such articles are quite resourceful. Google loves long-form contents. BUT does it hates short-form contents? These studies, in no way, explicitly mention that short-form contents cannot rank high in search engines. Sadly, what we see today is a common perception among the majority of bloggers and marketers that writing long contents is the only way to gain organic traffic. Here’s a nice post by Jon Morrow of Smart Blogger titled ‘20 Ways to Be Just Another Mediocre Blogger Nobody Gives a Crap About’. He isn’t alone in saying that. There are many who insinuate that if you are not writing long articles, you’re basically doomed. What was supposed to be a noble and helpful finding of multiple studies have now become THE ONLY WAY. You MUST write long articles or you will fail. This is similar to the pre-2010 era when, in early 2006, Darren Rowse of ProBlogger published an article advising that one should write blog posts less than 1,000 words count. At the time, the majority did what he said. Now the tide has shifted. Everyone seems to be rallying behind the long-form contents. The mainstream idea, so twisted and misrepresented, has made long contents the ONLY way to gain organic traffic. I personally like comprehensive contents that cover a topic in totality. I think they are great. The problem comes when everyone is fed a partial fact that these long-form contents are the only way to go about if you want ‘Google love’. Because going this way has its own flaws. There’s a common misconception here. Many people simply assume that long-form contents are of high-quality. And since quality is what Google likes, it prefers these long articles. Long contents do not mean good quality. And most importantly, short-form contents do not mean poor quality. Except for what we see on the first few SERPs, it’s very likely that a large part of the remaining results is pretty mediocre, including the long-form contents. So, short or long-form – they both can be either bad or good. And to say that longer articles have higher chances of being better, it’s equally absurd. It isn’t about the length, it’s about the blogger – what she/he is saying and how much value she/he is looking to provide to the readers. Many proponents of long-form contents, who believe ‘longer the better’, fail to understand that this approach is NOT fitting for every niche. You can’t have a 2,000 words article just to explain how to do crunches—not at least without being boring. You can’t drag it so long if you’re talking about the healthy breakfast for the weekends, how to fix a severe headache, or how epic Avengers: Infinity War would be. There are certain niches and topics that don’t require long articles. In the absence of long-contents, does this mean when ranking short articles Google only shows the mediocre results on its first page for such topics? So the idea of feeding everyone who’s starting to blog that they must write long-form contents is absolutely flawed. There are so many great bloggers who share with the readers some extremely resourceful ideas, guides, and life experiences. However, not necessarily all of them are nice at writing and storytelling. If what they have can be summed in 500 words, yet they are trying to reach 2,000 words count just to fit the mainstream narration of “long-form contents are best”, the quality of their article would be quite stale. Because the remaining of 1500 words would either be fluffs/fillers or non-related to the centric topic of the post. You only say what you have to say and what readers want to listen without talking unnecessarily – hasn’t this always been the key to successful blogging? 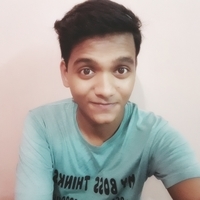 If someone clicked on the article titled “JPG or PNG – Which Image Format A Blogger Should Use”, the person would be looking for a definite answer and not really the history and technicality of JPG and PNG. This is another misconception. Many believe content is just about texts. Needless to say, successful content marketing strategies have proved it beyond well that visual contents play just as much of an important role in engaging readers, lowering bounce rate and increasing retention rate. So, your article of 300 words that also includes few images and videos can be just as resourceful as any long-form articles that lags any visuals. Meaning to say, if you’re looking to gauge the value and effectiveness of an article with just its length, you’re totally undermining the relevance of images, videos, graphs, animations and another form of contents. It’s surprising that those who order others to chase long-form articles, they conveniently escape the fact that readers’ concentration level is at its all-time low. Yes, we have an attention span of just 8 seconds. So how on earth do we expect people to continue reading one article for 6-10 minutes without being bored out of their mind? 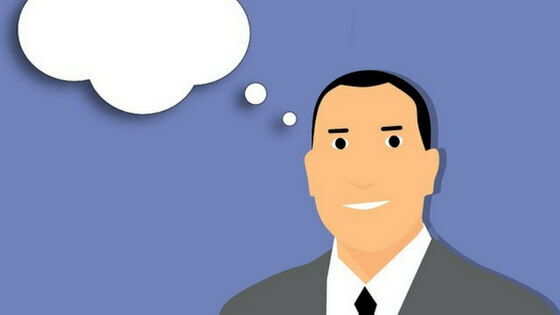 Even when the blogger is providing something mind-numbingly resourceful and interesting, the large part of the audience might not necessarily like it. It’s no secret that people want answers. And they want it quick. Even when they are reading celebrity gossips, they want to get to the main portion of the article quickly. If you’re going to bore with them with a tedious introduction, suspense-filled answers, and never-ending conclusion, not only will they leave your blog, they might not even return back to you again. In fact, a report in Time, dating back to 2014, claimed that 55 percent of visitors spend less than 15 seconds on a website. So if you try to engage readers in a 2,000 words article that you could have easily summed in 400 words, you’re basically disrespecting their time. And while you may succeed in increasing the dwell time of few readers through your irrelevantly long article, many would simply leave your blog for good. Also Read: Ideal Blogging Frequency - Publish Article Daily or Weekly? Google has more than 200 ranking factors. And it’s safe to assume that these factors, directly or indirectly, work to find quality contents across the web. Meaning to say, the search engine has many ways to identify whether a piece of content is of good quality or not. It has many parameters. The length of the article is only one piece of the puzzle. So just picking one factor and obsessing over it isn’t really a good thing. Want Google to think your blog has great contents? Signal it with high dwell time (which depends more on internal link building than content length), bounce rate, keyword density, header tags, better formatting, easy readability, doFollow links and more. Don’t just cling to one factor unnecessarily. It might come unnatural to many (sense sarcasm here), but delivering high value to the audience is very well possible with short-form contents. You don’t always need to be a drag if you want to say something to your readers. The clearer and succinct you are, the more efficient will be your communication. And the more efficient you are in what you’re saying, higher will be your conversion. So, at the end of the day, blogging is all about providing great value to your target audience in the best way possible. And you can do this even with short posts. And when you do this, Google would definitely love it without caring about the word counts. Again, I am not against long-form contents. I simply believe that one should write long articles if what they have to say demands it. Comprehensive articles are great and resourceful. And that’s what a blogger should aim for. However, out of this basic idea, a common notion that has emerged that short-form articles are bad and “Google-unfriendly”, it is utterly absurd. How you can provide your readers the best value for their time, how you can help them in the best way possible and how you can effectively and efficiently resolve their pain point – these are what must be everyone’s concern and motto. The word counts of the article should be secondary. Because what you have to say really demands it. Your topic requires you to cover things in details. Your readers want a comprehensive explanation. Yes, write long-form contents. But do it because you have to say so many things to the readers and not because of the existing notion like longer contents are better and Google dislikes short contents. Aim to make your articles useful and interesting—NOT lengthy. P.S.S. This article is of 1756 words count. Do you think the idea that we MUST write long-form contents is right?